Yesterday morning, I heard this Showbiz news over a friend in YM. Apparently, in the pilot episode of SNN (Showbiz News Ngayon) of Kris Aquino and Boy Abunda, Nina gave an exclusive interview to Kris Aquino. The soul siren told Kris Aquino that her ex-boyfriend Nyoy Volante owes her 1.4M since 2005. 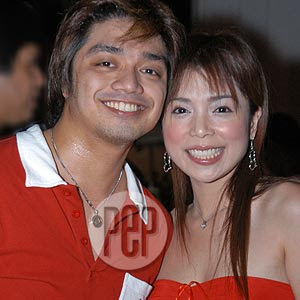 In 2005, Nyoy Volante borrowed 600,000 Pesos to her and promised to pay her after a week. Nyoy failed to pay though. When they were a couple already, Nyoy borrowed again until the amount totalled to 1.4M Pesos. When they separated, Nina asked for the payment and Nyoy's mother gave a post dated check with the total amount. The check bounced though. Nina and her mom then filed for B.P. 22. Nyoy's camp issued again checks and sadly it bounced again. Nina's camp now are filing for Estafa. Nina also cleared in the interview that she did not cheat on Nyoy when they were together. The financial issue was also one of the reasons of their break up. Here is the complete interview from SNN. Oh bad publicity for Nyoy. Indeed it is a bad feeling if you think your bf/partner use you for money or takes you for granted with financial matters. I like the big smile on their face! @Webbielady, yeah I agree with you I think that's what happening to my classmate now.